I’ve been using Bare Bones Yojimbo for over a year now – I’ve enjoyed using it and it’s really fit into my workflow – especially when the script that sent URL’s to Pukka (my Del.ic.ious client) and to Yojimbo, worked (it’s been broken since the last Pukka update). It wasn’t a huge deal, being only one of the many things I used the product for. But somewhere along the way, my needs have changed. For the last few months I’ve been hearing about Evernote. CC Chapman has a great write up here and Rachael Murphy’s has one here. But I was really trying to keep away – I didn’t want to interrupt my workflow with another diversion. Then came the iPhone App Store and the outpouring of productivity applications. Finally – I started to look at Evernote and it’s key component – syncing. 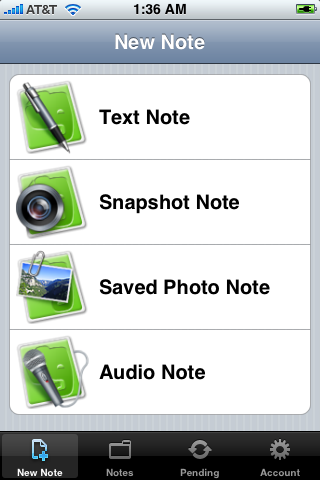 Now, with the iPhone, I can easily add any information – pictures, audio, snapshots and text notes – right to Evernote. Evernote syncs between my desktop, my iPhone and the online Evernote web application – everything current, everything easily accessible. I’m still working on how I’ll completely integrate this into my workflow – I want to get my Backpack pages in and work on someway of automatically saving documents to Evernote with the ease of their web clipping FireFox extension or bookmarklet. But I’m really enjoying the experience so far, and while it’s hard to let go of Yojimbo, it seems like Evernote has the right features at the right time.